Is it necessary for Christians to be royalists? But it got me thinking – what if I don’t like the Queen? What if I’m a republican? 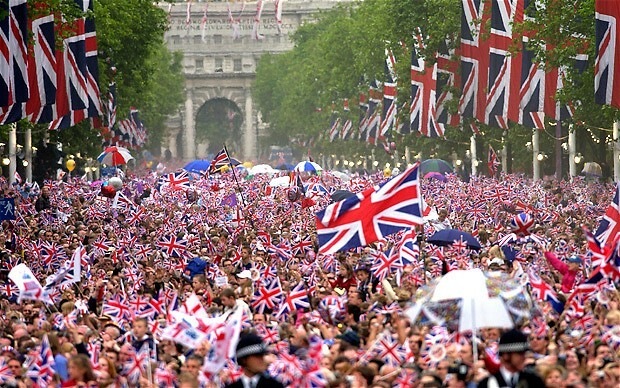 What if I was a visitor from another country and don’t share the same devotion to the monarchy? How does this look to an outsider? I’ve also been to other churches where the British Union Flag is hung in a prominent position at the front of the church. It is the first thing I look at as I go in. I half expect a verse or two of the national anthem before the service starts. Is this flag a help or a hinderance? Is it really necessary? There is absolutely nothing wrong with being proud of your country and your part in its heritage. This is something to be embraced for sure. I understand that culture and religion are so often blurred together that separating one from the other is impossible. But what message does this portray to people outside the faith? Do we expect them to have to undergo two conversions in order to follow Christ – one to him and one to the flag? The problem comes when our nationalism (wherever it is directed) becomes a blockage to the gospel. If we require people to convert to our socio-political agenda and to Jesus there is clearly a problem. After all, Jesus + something else = nothing. The Christian faith can (and really must) have implications for every area of life and society, including politics. There are immense ethical implications that flow from biblical Christianity – there is no such thing as a personal faith if that’s where it stays. But true faith -one that is centred on Jesus himself – does not include one particular society’s cultural preferences. Such a brilliant example – look at the twelve men that Jesus chose to be his apostles. No self-respecting Rabbi would have been so controversial. Numbered among the twelve is a Jewish nationalist zealot by the name of Simon who loved his country with a passion. Numerous uprisings were documented around Jesus’ time, mainly led by zealots like Simon, rebelling against the ruling Roman authorities. They hated the Romans. But also among the twelve was Matthew, a tax collector who worked for the Romans by collecting taxes from his own (Jewish) people. A traitor, so to speak. A traitor and a zealot on the same team! No one else could have brought them together other than Jesus. When Jesus is the centre of your world, traditional boundaries such as what country you love, what race you are of, what tribe you come from – factors like that take second stage. Only biblical Christianity allows you to be a nationalist or a royalist or whatever, but yet still be united with other people who hold different views. So it’s good to be passionate about our country and people. We don’t have to abandon our enthusiasm when we put our faith in Christ. But when we start insisting that other people in the faith must also adopt our socio-political preferences, we may be in danger of (at least attempting to) undoing the life-saving work that Christ has done in his gospel and ultimately detract from the beauty and the glory of God.